December is a rough month. Christmas is trouble, trouble...Oh, stop your whining, Gail, about the epitome of First World problems. Okay. So what did I do this week that didn't involve whining? Goal 2. Prepare Mummy Hunters For Submission. I stumbled upon an opportunity to submit this manuscript somewhere and took it. Submissions are good. Horn Book post. Promoted to Google+, 2 Google+ communities, and Twitter. I actually could be tweeting this some more. Time Management Tuesday Meditation post. Promoted to Google+ and Twitter. Again, I could be tweeting this more. #Readukkah Goodreads post. 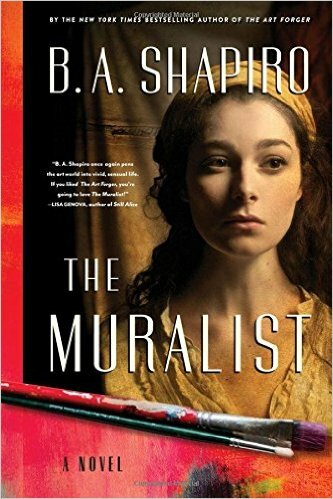 Finished reading The Muralist by B.A. Shapiro for #Readukkah, posted a review at Goodreads, and tweeted it. Joined Netgalley. I hope this will make it possible for me to support some new authors/books. Goal 6. Generate New Work. I was going to do blueprinting of chapters of my NaNoWriMo project. But instead I got excited about the voice I'm using, and I wrote the first chapter. In three days, which is stellar for me. Been feeling very satisfied for the last 24-hours over this. Yay for submissions and new voice, new work. I really enjoyed The Muralist. (there, that's my review.) Hope you enjoy the rest of December!